Ebac are the market leaders in both the European Watercooler manufacture and UK Dehumidifier markets. Founded in County Durham, UK in 1972 by current Chairman John Elliott, Ebac has grown from a small one man business to a flourishing organisation which has continuously grown by developing truly innovative products in the Dehumidifier and Watercooler markets. With constant research and development, now they have come out with Plumbed In water cooler rental, which can be given direct to homes, businesses, schools and hospitals across the UK! Currently, Ebac is offering a great deal on their 3 most popular products, with prices ranging from ￡13 up to ￡25 per month. All products include the advanced hygiene, energy efficiency and quality features that Ebac are renowned for. Plumbed In Water Cooler - Emax and Fmax available from as low as £20 per month. No hidden fees! Extra benefits of using Plumbed In Water Cooler includes cheaper water cost, continuos water supply regardless of usage, environmentally, better storage and space etc. 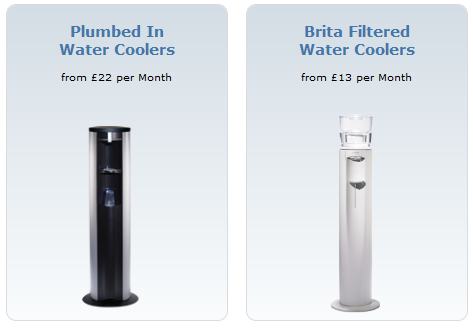 Unsure of which Water Cooler is suitable for your home? Ebac is so consumer-friendly that the company has Water Cooler Wizard to help you to decide on which product and services you want. This is a free service provided exclusively by Ebac. Latest technology of vacuum flask type outer skin, reduces extra energy consumption. Stand-by consumption is only 0.33kW per hour per day. Needless to say, Ebac provide price matching. Just send them your current water cooler price and they will do the rest for you. Whole of the UK mainland for installation and servicing. Established in 1993 and constantly improving. Fully online management, both purchasing and invoicing. 100% sanitisation and 50 times quicker than the conventional water cooler. Modern, stylish and practical water coolers. You can have your company logo on the water cooler. Good products will always attract and retain consumers. Thus no contract is necessary to bring more business. We believe in quality! We are the manufacturer, and we provide direct rental services. Thus reducing the total cost. Water plays a major role in keeping our body healthy, and water coolers can give us safe and clean drinking water. Water coolers are machines that filter, dispense and cool water to provide us with safe drinking water to put away our thirst.